I clicked on that link too.. I was about to become another victim of that scam.. I show next page as below.. It's Facebook Birthday.. !! I wasn't knowing that.. there is not any official facebook link.. but I continue with next page.. To get Tshirt click here.. 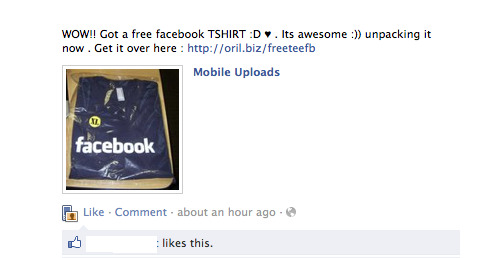 I clicked..
"These Facebook scams hardly ever fail to amuse me. I say this for two major reasons. One, there are always enough gullible users, no matter how many scams have embarrassed them and two, Facebook hasn’t really found out a way to tackle these spammers. Tackling might be far fetched, I doubt if they even have an intent to keep off these spammers. 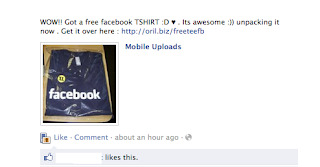 Well, the biggest Facebook scam underway right now is about Free Facebook T-shirts and I’m seeing a lot of not-so-gullible users getting trapped this time around." Another site saying there are two scams.. another pic with facebook tshirt..
Uffo.. this pic made 80% of facebook users to click on it.. nice way..
Hacker attacks targeting Facebook are endless. The most recent one proved that scammers have enough of imagination to create more and more scams with different subjects. You never knew that you have a secret mobile e-mail address? Well, you can now learn about it via the legitimate Facebook page or via a special video, created by hackers in order to make it easier to steal your data. 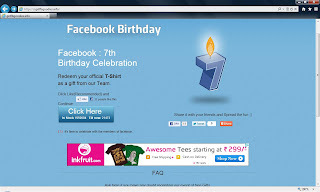 A Facebook T-shirt seemed like a big enough reason for users to visit an especially created by hackers web page, that claimed to be celebrating Facebook's 7th birthday. With the tricky comment "WOW!! 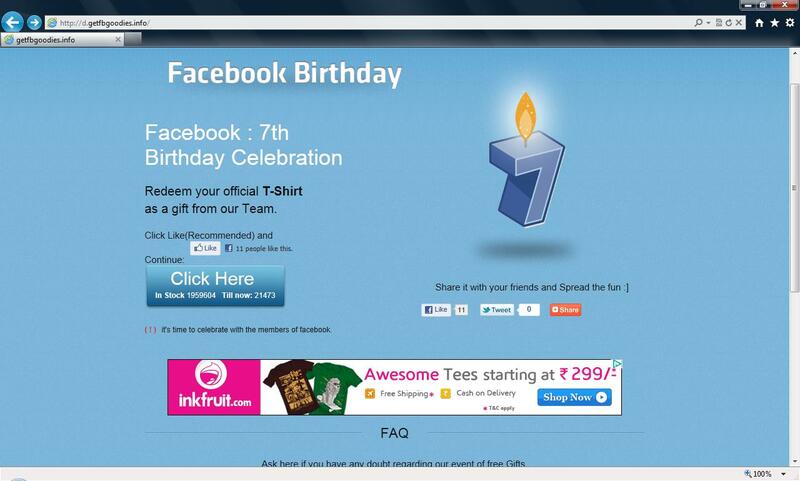 Got a free Facebook T-SHIRT :)). Unpacking it now. 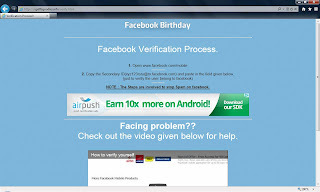 Get it here : [link]", scammers have managed to attract the attention of Facebook lovers. 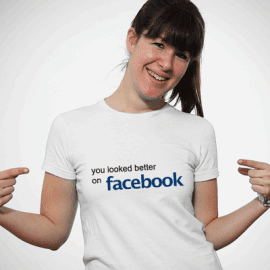 To make it even more luring, they stated that there 1.9 million official Facebook T-shirts - enough for the fastest Facebook users. The procedure of claiming a T-shirts is the following: users first have to verify they have got a Facebook account. Then the reason for the attack becomes clear - you are prompted to visit Facebook Mobile and copy (then paste) your SECRET mobile e-mail address. This is where you should stop and think, because this address, if revealed to others, can be used to write status posts, upload photos and videos - all that on your own page and on your behalf! That is the reason why scammers need your address - to abuse your account. To make things look even more legitimate, and to help you out giving them your secret data, hackers have been bold enough to create a YouTube video with instructions of where exactly your secret mobile e-mail address is and how to fill it in in their form. 2. click on "Send me my upload email" which will open one dialog. 3. In this dialog box click on the "refresh your upload email" link in the bottom. Please note that you can refresh this email address only a limited number of times. This threat might have not reached you, however, keep in mind that such threats appear constantly and the next bait might be luring enough for you to make you click. It stands to reason that should be extremely cautious when you are prompted to give away your account information - of all sorts. Do try-catch really effect runtime performance in .Net application? Recently, a friend told me that someone had told him that writing a try-catch block in C# resulted in a "huge penalty" in terms of performance compared to if you had not written it. I was little worrying if that statement is true or not.. I have googled it and read many articles.. also made few small applications.. when no expection occurs and expection occurs. That is, merely writing such a block actually hurt program performance, even if an exception was never thrown. He didn't believe this was true, and rightly so-it's completely wrong. That is, bytecode is what we actually execute and the rest is there to describe the extra details. To give you an example of the interplay between them, consider a method call. The bytecode stream contains the call instruction, followed by a method token, which is actually an index into the methods table. The methods table in turn allows us to find out where the bytecode for the method we're calling starts, so we can execute it. The .Net CLR has a concept known as a "protected region". A protected region is a sequence of instructions that has an associated handler. In C# or VB.NET, the instructions in a protected region correspond to code in a try block. There are various types of handlers, including typed ones (that catch only a certain type of exception) and finally ones. Note that a try...catch...finally will result in two protected regions at the CLR level, one for the catch and one for the finally. The protected regions will cover the exact same sequence of instructions, just have different handler addresses. They are ordered with innermost handlers coming first. Here is the important part when it comes to performance when an exception is not thrown. Since the protected regions are stored in a table and are not in the bytecode, and because the CLR does not need to worry about the exception handlers unless an exception is thrown, then there is no runtime penalty for having a try...catch block. For finally handlers it is a little different, because we do need to run those even when we don't have exceptions. However, since we can compute what we will need to run when statically, the JIT compiler can still emit code that jumps to the finally handler at the appropriate time, making the execution overhead of one of those most likely just a jump and a return. So that's most of the answer to the question that was asked, but for interest let's take a look at what happens when an exception is thrown. Provided the current method has protected regions, you scan through the table to find if there are any that cover the instruction where the exception was thrown and that are capable of handling it (they are looking for an exception of the correct type, for example). If there are multiple nested handlers that could handle the exception, the ordering of innermost first means that we will find the correct handler. If we find a handler, we execute it. If we don't find one, we move down to the next method in the call stack and check if it has a suitable handler, keeping going until we find one (or we discover that the exception is user-unhandled and terminate the program). This means that the cost of throwing and catching an exception is dependent on how far down the call stack you have to go to find a handler. From this we can conclude that .Net is optimized for the case where you do not get exceptions. Since exceptions are intended to happen only in exceptional (that is, unexpected) circumstances, this is a sensible design decision. If you inclined to use exceptions for ordinary flow control, this should give you another reason not to. So what can we conclude? The overall cost of a try...catch block that never handles an exception is a few bytes of memory - or at worst a few words - for the entry in the protected regions table. The only possible runtime penalty is the extra time to load those extra few bytes into memory. Since they are stored way away from the JITted bytecode stream, it's highly unlikely you're going to incur any additional cache-misses at runtime as a result of the handler too. Thus, the cost is essentially nothing. The cost of not handling an exception that you should have may well be that your program crashes. This results in unhappy customers, a hit to your reputation and development time to go and do a bug-fix, which will almost certainly be much greater than if you had put it in there in the first place. Obviously, protecting code that can not throw an exception under any circumstances is a waste of your development time. But otherwise, it's best to be safe rather than sorry, safe in the knowledge that even if an exception never does occur in that bit of code, it's not really costing anything anyway.